Look great without trying too hard in a grey cable sweater and black leather shorts. 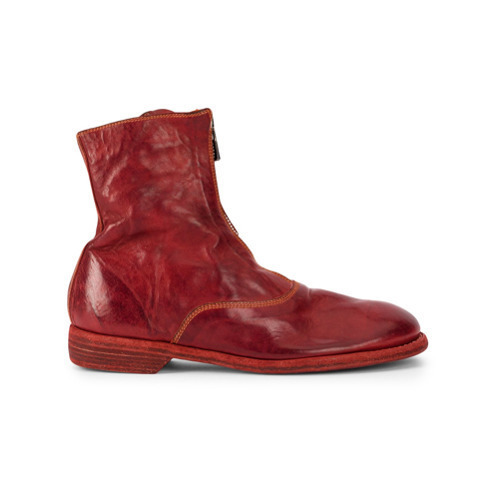 You can get a little creative on the shoe front and elevate this look by rounding off with a pair of Guidi burgundy leather ankle boots. Wear a grey knit sweater dress for a daily ensemble that's full of charisma and personality. For something more on the sophisticated side to finish off this look, complement your outfit with a pair of Guidi burgundy leather ankle boots. The go-to for a killer off-duty ensemble? A burgundy horizontal striped sweater dress. 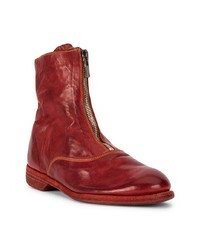 Balance out this look with a smarter kind of footwear, such as these burgundy leather ankle boots. Pair a navy double breasted blazer with light blue jeans for relaxed dressing with a modern twist. With shoes, go for something on the more elegant end of the spectrum and finish off this getup with a pair of burgundy leather ankle boots. If you gravitate towards comfort dressing, why not consider this combo of a black biker jacket and black ripped skinny jeans? 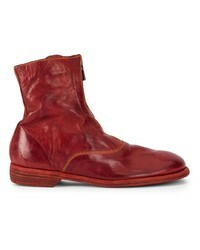 Let your outfit coordination prowess truly shine by finishing your ensemble with Guidi burgundy leather ankle boots. You're looking at the hard proof that a beige print peasant blouse and blue ripped boyfriend jeans look awesome when you pair them together in a relaxed look. Bring a dash of sultry sophistication to this look by rounding off with burgundy leather ankle boots. 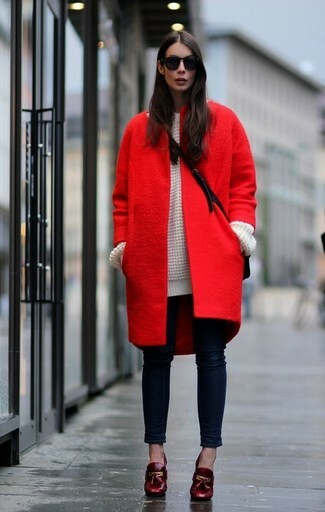 This casual combo of a red coat and navy skinny jeans is very easy to put together without a second thought, helping you look chic and prepared for anything without spending too much time combing through your wardrobe. 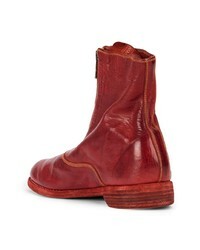 Guidi burgundy leather ankle boots work wonderfully well with this outfit. 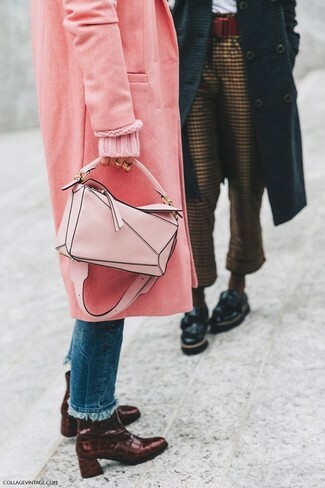 No matter where you find yourself over the course of the day, you'll be stylishly ready in this relaxed casual combo of a pink coat and blue jeans. We're loving how a pair of burgundy leather ankle boots makes this getup complete. One of the coolest ways to style out a beige long sleeve t-shirt is to team it with a pink pleated midi skirt for a casual ensemble. You could perhaps get a bit experimental in the footwear department and polish off your ensemble by slipping into a pair of burgundy leather ankle boots.